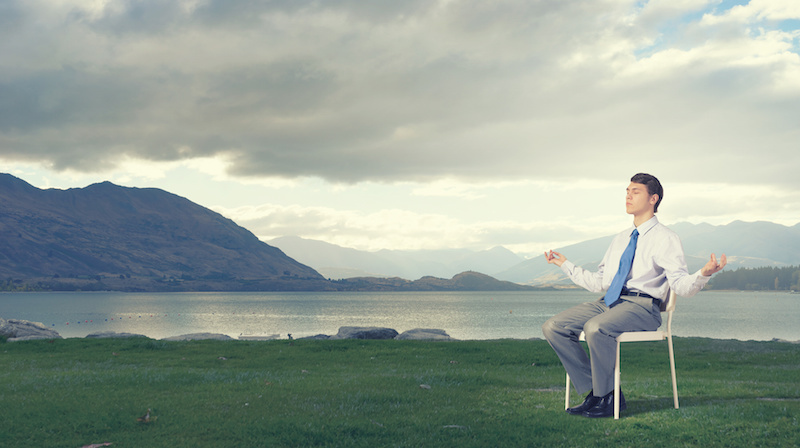 The stress of being a corporate litigator was getting to Chris Edgar. He often found himself awake at 3 a.m., fretting about the details of a case, and he struggled to let go of that stress during his rare off hours. Chris was no stranger to highly charged work environments. He had served as a law clerk for Samuel Alito, now a U.S. Supreme Court justice. The pressure continued after he joined a busy firm representing corporate clients. Even in his free time, Chris struggled to let go of worries about work. And the chronic stress prevented him from being optimally productive during the workday as well. Seeking ways to relieve some of his anxiety, Chris started exploring mindfulness. He delved into yoga, meditation, and practices like qi gong. The initial results were good: after work, he was finally able to unwind, and he was relieved to find that he could also sleep better at night. Then about six months later, Chris got an even bigger surprise. It turned out that his yoga and mindfulness rituals had started helping him to perform better at work, too. He noticed he was feeling calmer, and he was far more productive and able to focus on the task at hand. And though he was more relaxed, he was actually getting more work done in less time. Chris was excited to spread the word and help more people experience the same benefits. He began publishing articles describing his techniques for pairing mindfulness practices with productivity and eventually realized he was ready to write a book about the topic. In 2007, he left his job at the law firm to focus on mindfulness and productivity: giving talks, coaching, and writing. 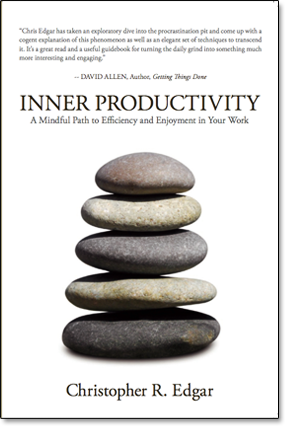 He authored the book Inner Productivity: A Mindful Path to Efficiency and Enjoyment in Your Work, which shows readers how to increase their focus and get more joy out of their work. Since then, Chris has returned to the world of law—on his own terms this time, as an independent corporate lawyer. He continues to practice what he preaches, and to reap the benefits that come with practicing mindfulness. Do you ever find your mind wandering at work? Or feel too overwhelmed about an assignment to figure out where to start? Choose one of these exercises from Chris to try out at your desk right now. When you feel anxious or stressed in the workplace, a common coping mechanism is to escape from those feelings by procrastinating — whether that means playing on your smartphone or finding a co-worker to engage in conversation. You may even hold your breath without knowing it, which can causes feelings of tightness in your muscles. And who does their best work when they’re distracted, worried, and literally holding their breath? There’s got to be a better way! Take a moment to breathe. While you’re doing that, allow yourself to focus on uncomfortable sensations, like knotted shoulders or tightness in your chest. It’s easy to get lost in the details of a project — and feel overwhelmed — to the point that it becomes difficult to focus at all. There’s just so much to do. And once your mind starts racing or listing things, it can be hard to move forward with the actual work. Take a comfortable pause and remind yourself that completing each task will take you one step closer to your overarching goal. 3) Stuck? Tune in to silence. When you feel stuck on the job, stumped by writer’s block or unable to tap into your creativity, you might be tempted to beat yourself up. It’s a tough situation—the frustration can build on itself, which doesn’t do much to get the creative ideas flowing. In fact, it can often make things worse. Sit quietly and listen to the silence. What people don’t realize is that sitting in silence for a bit and acknowledging the emptiness of thought often will bring their best ideas to the forefront, Chris explained. It can be uncomfortable at first, but eventually the quiet will allow frustration to fall away and thoughts to bubble up, providing new focus to the work. Time and focus are precious commodities, especially at work. So make the most productive use of your time — while feeling calm, centered, and successful — by spending a few minutes on these techniques each day. It can make a world of difference.